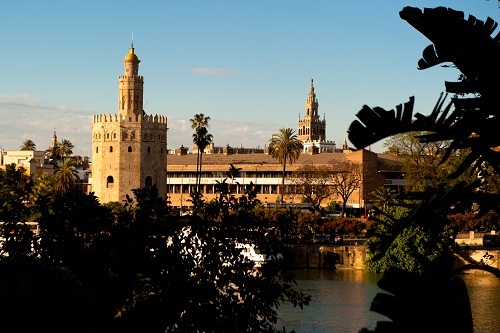 Join a Group and enjoy a Sightseeing Tour of Seville. 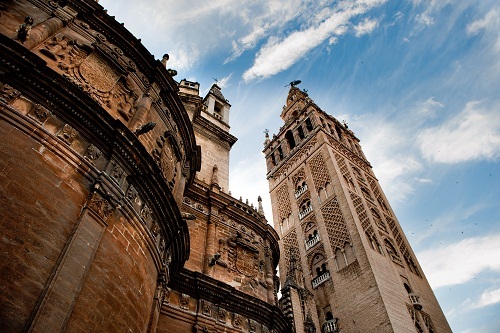 Visit the Jewish quarter, Royal Alcazar, Cathedral - Giralda and Plaza de España and Thermal Baths + Aromatherapy. 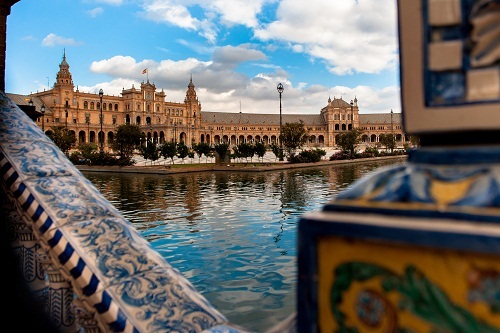 Pick up point:Pick-up at your hotel in Seville city between or meeting point assigned by the agency. Pick up time: 9:30 am - 10:00 am. 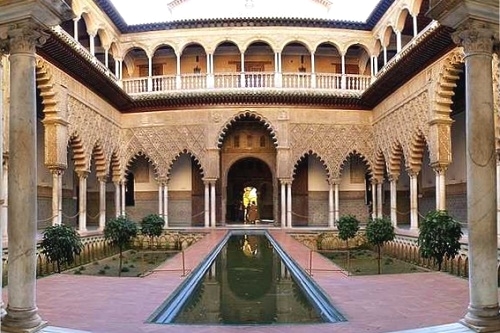 We will also discover the most emblematic monuments of Seville by luxury minibus: the Santa Cruz, the famous Jewish quarter: a labyrinth of narrow streets, which lead to the gorgeous Plaza de los Venerables. Visit the Royal Alcazares, World Heritage and one of the most remaining examples of Mudéjar architecture, the Cathedral-Giralda of Seville, the largest gothic cathedral of the world. We will start with a Sightseeing tour, where you will learn more about famous monuments of Seville such as the University, an Old Tobacco Factory, the San Telmo Palace, The Golden Tower, Isabel II Bridge or the Macarena Basilica. You will also discover the Plaza de España, the centrepiece of the 1929 Iberoamerican Exposition. The tour ends in the Cathedral. Do you need some relaxing time? Check in Aire de Sevilla just in the heart of Santa Cruz atop an ancient Arab bathhouse and Roman ruins. The unique ambiance inside displays the Mudejar influence in Sevilla through the stuccoed and tiled walls, clay works, and the dim lighting of the authentic bronze lanterns. There is a hint of Roman descent as well through the seating and architectural style of the bathhouse. Aire de Sevilla is a refuge that portrays the history of ancestors who used the public bath as an art form for the senses. 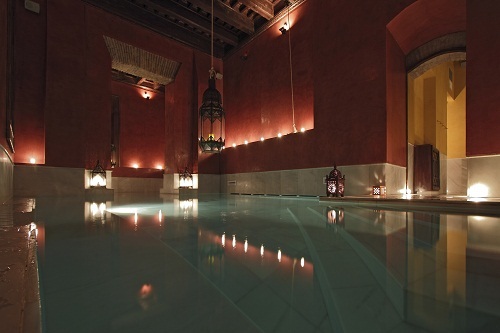 The bathhouse offers the Arabic tradition of relaxation through water. Take a journey through three different types of baths; first a warm bath (96ºF), second a hot bath (104ºF), and finally a cold bath (60ºF). These temperature changes create contrasting sensations for the human body. There is also a salt bath. The session will last an hour and a half approximately. Swimsuits are obligatory. If you do not have one, you will be given one free of charge. Slippers, as well as, towels, hygiene items and hair dryers are included in our service. We provide individual PIN code lockers. In the wet areas, only the use of slippers issued by they are permitted. While in the Baths, silence is essential (within reason). It is recommended to leave all personal items in the lockers. Visitours is not liable for any losses. The length of service Bath + Aromatherapy is 90 minutes. If the 15 minute massage treatment is included, the massage will be given when deemed by the therapist during the course of the 90 minute thermal treatment. It is recommended to be 15 minutes early in order to organize the booking arrangements. The use of the bathrooms is intended only for people over 16 years old. Please inform the front desk, and the therapist of any health considerations or injuries we should consider. Use of the facilities is not recommended for pregnant women and /or people with cardiovascular disease. Return Point & Time: Drop-Off not included / The tour will finish at 1:45 pm approx. Departure Point & Time Thermal Bath: 3 pm to 7 pm Alemanes Street 18. Seville city center. Sightseeing Tour of Seville + Guided Tour Barrio Santa Cruz, Alcazar, Cathedral, Basilica and Bullring + River Cruise Guadalquivir. Join a Group and Sightseeing Tour, Plaza de España, Santa Cruz Neighborhood, and River Cruise, including: Local Guide, Ticket and Transport. Join a Group and Walking Tour & Hard Rock Cafe Sevilla, including: Guide and a Cup of Wine or Dinner at Hard Rock Cafe Sevilla.